Last weekend, the 6th edition of the annual SpaItalia event at the legendary Spa-Francorchamps racing circuit in Belgium honoured one of Italy’s most prestigious car manufacturers, Maserati. The event also paid homage to Maserati’s founder Alfieri Maserati, who was born 120 years ago in 1887, as well as celebrating Maserati’s 50th anniversary F1 title with Juan Manuel Fangio. In the central paddock overlooking Eau Rouge, five historic racing cars represented Maserati’s glorious heritage. In chronological order, the first in the display was an O.S.C.A. Barchetta MT4 2AD dating from 1952. O.S.C.A. (Officine Specializzate Costruzioni Automobili - Fratelli Maserati SpA) was founded in 1947 by Ernesto Maserati, Ettore Maserati and Bindo Maserati – three brothers who left Maserati after their ten-year contract with Adolfo Orsi had been terminated. Ten years earlier, in 1937, the remaining Maserati brothers from the original company bearing their name and founded in 1926, had sold their shares in the company to the Orsi family, who, in 1940, had relocated the company headquarters to their hometown of Modena, where Maserati remains to this day. The MT4 was O.S.C.A.’s first car, the model-name specifying “Maserati Tipo 4”, with the first example of the type being launched in the spring of 1948. “Tipo 4” denoted the number of cylinders, with a 1,092 cc Fiat-derived block, a compression ratio of 11.5:1 and a maximum power output of 72 bhp @ 6,000 rpm. The MT4 first raced at Pescara, and later won the Naples Grand Prix in the summer of 1948 in the hands of Luigi Villoresi. The following year saw the engine capacity being increased to 1,342 cc, subsequently raising the power to 90 bhp @ 5,500 rpm. The car on display at SpaItalia represented the evolution of the model, which was introduced in 1950. With the evolution, the MT4 engine was redeveloped with a new cylinder-head and twin camshafts. The power outputs were increased to 92 bhp @ 6,600 rpm and 100 bhp @ 6,300 rpm respectively. The evolution also saw the introduction of new bodywork with integrated wheelarches, with the shape set to evolve over time. The MT4-2AD was built from 1950 until 1956, and a small number also received berlinetta bodywork from various carrozzeria including Pietro Frua, Michelotti and Vignale. The engine capacity of the MT4 was increased again in 1953 to 1,453 cc, producing 110 bhp @ 6,200 rpm. A year later saw the final evolution with a 1,491 cc engine utilising two spark plugs per cylinder, as well as twin camshafts. In this guise the MT4 produced 120 bhp @ 6,300 rpm. Externally these cars were basically identical to the smaller-engined variants, with almost all MT4 cars sharing the same 2,200 mm wheelbase; in fact only the early single-overhead camshaft cars had a wheelbase measuring 100 mm longer. The development of the MT4 saw the appearance of the TN in 1955. For this model, a revised and modified chassis with 2,200 mm wheelbase was fitted with a new 1,491 cc double-overhead camshaft engine, now producing 125 bhp @ 6,300 rpm. The bodywork remained similar in style to the MT4. The TN was produced until 1957, however the engine was also used in some later MT4 cars. In 1963 the O.S.C.A. company was sold to Count Domenico Agusta, owner of the MV Augusta motorcycle company, however was closed four years later, in 1967. Certainly the most legendary of all Maserati racing cars is the 250F, a car which was also present at SpaItalia to honour Juan Manuel Fangio’s F1 title for Maserati in 1957. The 250F first raced in January 1954 and competed in the 2.5-litre Formula One classification (hence “250” and “F”). A total of 26 examples were built, with the model remaining in use by Maserati customer teams until November 1960. The 250F based its engine on the Maserati A6 SSG’s 2.5-litre straight-six (220 bhp @ 7,400 rpm). It also used ribbed 13.4” drum brakes, independent wishbone front suspension and a De Dion tube rear axle. It was built by Giocchino Colombo, Vittorio Bellentani and Alberto Massimino, with the tubular spaceframe being designed by Valerio Colotti. The Maserati 250F was instantly victorious, with Juan Manual Fangio winning the first of his two victories during the car’s debut race at the 1954 Argentine Grand Prix. The same year saw Fangio and Stirling Moss leave for the newly reorganised Mercedes-Benz team; however Fangio won the 1954 Drivers’ World Championship with points gained from both Maserati and Mercedes-Benz. Although Bellentoni and Massimino left for Ferrari, 1955 saw the Maserati 250F set up with a 5-speed gearbox as well as SU fuel injection (240 bhp) and Dunlop disc brakes. Jean Behra ran this in a five-member works team which included Luigi Musso. In 1956 Stirling Moss won at the Italian Grand Prix and the Monaco Grand Prix in his private car. A streamlined version of the 250F, bearing partially enclosed wheels, was used in the 1956 French Grand Prix. In 1956 three 250F T2 cars first appeared for the works drivers. Developed by Giulio Alfieri using lighter steel tubes they sported a slimmer, stiffer body and sometimes the new 315 bhp V12 engine, although it offered little or no real advantage over the older straight-six. The V12 was eventually reused in the unsuccessful 1966 F1 Cooper Maserati. In 1957 Juan Manuel Fangio drove to four more championship victories, including his legendary final win at German Grand Prix at the Nürburgring (Aug. 4, 1957), and his final race at the French Grand Prix. The Constructors' World Championship was introduced in 1959, by which time the 250F was generally outclassed. However, the car remained a favourite with the privateers, including Maria Teresa de Filippis (who was also present at SpaItalia) and was used until 1960. In total, the 250F competed in 46 Formula One championship races with 277 entries, leading to eight wins. 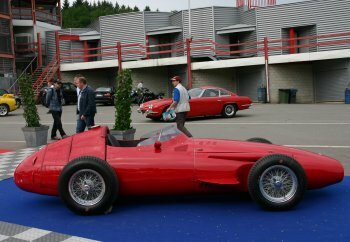 In the central paddock overlooking Eau Rouge, five historic racing cars representing Maserati’s glorious heritage, formed the centrepiece at SpaItalia of the commemoration of Juan Manuel Fangio's title. Last weekend, the 6th edition of the annual SpaItalia event at the legendary Spa-Francorchamps racing circuit in Belgium honoured one of Italy’s most prestigious car manufacturers, Maserati. 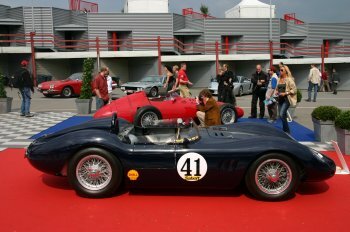 The Maserati 250 SI on show at SpaItalia was built in 1956 and was chassis #2411, driven by Jojo Berger. 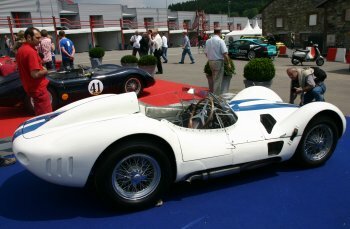 Just 28 of these all-aluminium tubular spaceframe chassis racing sportscars, which weighed 660 kg, were built between 1955 and 1957 by Maserati. The 250 SI competed in races such as the Mille Miglia and was driven during its career by the top drivers of the era including Stirling Moss and Piero Taruffi. The 250 SI had bodywork created by several firms including Fiandry and Fantuzzi. Perhaps the most eye-catching of all the historical Maserati cars on display at SpaItalia was the Tipo 61 “Birdcage” (chassis #2457) from 1959. Fitted with a 2,850 cc, 240 bhp engine, the Tipo 61 is among one of the most iconic racing cars in history. Only 16 examples of the Tipo 61 were produced between 1959 and 1961 by Maserati for racing in Le Mans. It became famous for its intricate tubular space frame chassis, containing about 200 aluminium tubes welded together, hence the nickname "Birdcage". This method of construction provided a more rigid and at the same time, lighter chassis than comparable sports cars of the era. The Camoradi team became famous racing the Tipo 61's but despite being faster around the track than other cars, the Birdcage was unreliable and often retired from races due to problems with the gearbox. The Tipo 61 was unveiled in 1959 when Stirling Moss easily won a race behind the wheel, attracting the attention of Lloyd "Lucky" Casner. Casner founded the Casner Motor Racing Division who raced three Tipo 61's in the Le Mans of 1960. The Tipo 61's never won Le Mans due to reliability issues, however in both 1960 and again in 1961 the Camoradi team won the Nürburgring 1000km. The SpaItalia Maserati display included a replica of the Tipo 151 Le Mans Prototype. The Tipo 151 marked a return to a more traditional concept of racing car design, due to a change in the FIA’s endurance racing regulations in 1962. The regulations were changed so that more manufacturers would be encouraged to compete with GT-style cars, which was mainly an attempt to protect the championship from potential fallout of works teams. With no suitable production Maserati to use as a basis for homologation into the genuine GT ranks, it seemed to a couple of the firms most highly favoured customers that this new class would suit a low volume custom-built model based primarily on existing Maserati componentry. 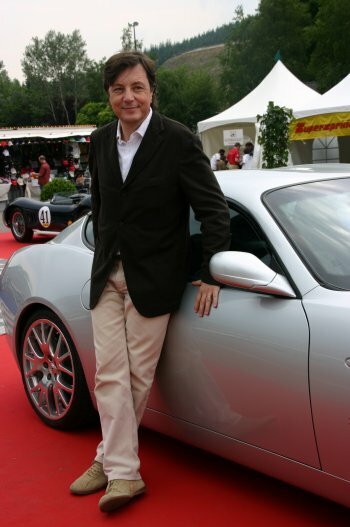 The pressure was coming from two of Maserati's importers, Briggs Cunningham in the US and Colonel Johnny Simone in France. After assurances that the customers would foot the bill for any development, a deal was struck and Maserati, led by Giulio Alfieri, quickly designed a front-engined Berlinetta known as the Tipo 151. Just three 151's were originally built, one of which (chassis 002, the Maserati France car) was extensively modified by the factory between spring 1962 and early 1965, the other two (004 and 006) being sold to Briggs Cunningham. The resulting Maserati Tipo 151 used a frame comprising a trellis of both round and oval large tubes, independent front suspension with hydraulic shocks and coil springs, and a floating De Dion axle which had many similarities to that used on the Type 64 completed a month or so before. The V8 engine was derived from the 450S with a reduced displacement of 3,943 cc. 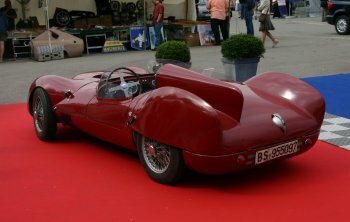 The body was reminiscent of the 450S designed by aerodynamicist Frank Costin and bodied by Zagato, but with an accentuated Kamm tail. The mandatory GT-style doors opened half way up the side due to the longitudinal tubes of the frame and the lateral 160-litre long-range fuel tanks. The car was fitted with 16-inch Borani centre-lock wire wheels, measuring 6” and 7” at the front and rear respectively. Although Maserati stated that the car weighed only 895 kg, the Tipo 151 in reality weighed closer to 975 kg. 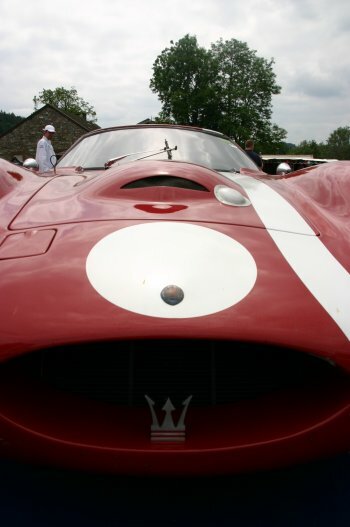 At Le Mans in 1962 the Simone car was in the Maserati France colours of red body with a tri-stripe whilst the Cunningham team cars had a white body with two blue stripes. At the end of the race, the Cunningham cars were shipped back to the US. The Simone car returned to the factory for revision in preparation for the 1963 Le Mans edition. Improvements to the Simone car included a new engine, the standard production 4,941 cc motor derived from the 5000GT but with single ignition and indirect injection, but now producing 430 bhp and now renumbered as 151/1. The car came back again to the factory in preparation for 1964 when there was a massive change to the frame, the mechanicals and the body. Now designated 151/3 (Tipo 152 by some) and jokingly called the “racing van”, the engine was unchanged in size. For 1965 there was again work on the frame and the body and the displacement of the engine was increased to 5,046.8 cc - this version (151/3) is called the Tipo 154 by some. The driver Lloyd "Lucky" Casner was killed during practice prior to the race, with the car subsequently being scrapped. The engine went on to power the Tipo 65 less than 2 months later. The replica on display at SpaItalia represents the Tipo 151/3 Simone car with “bread van” type bodywork. Unfortunately it cannot be ignored that this replica is far from a faithful copy when considering the bodywork, which differs in numerous aspects to the original car.